The history of gin and genever is well-documented from the 18th Century. However, before that, it’s murkier, especially when it comes to Dr. Sylvius, the man attributed with inventing our two favourite drinks. There are many defining moments in the history of gin and genever. The Gin Craze in the 1700s conclusively altered the course of gin’s history. The introduction of the weekly gin ration by the British Navy in the 19th Century is another, or the invention of the continuous still and its positive impact on gin production, all the while contributing to the decimation of genever. Going back further in time, there’s much to say about the Dutch King William III, who settled on the English throne in 1689, after his predecessor, James II, fled to France. It is seen as the start of gin’s history in the United Kingdom. William III sought to weaken his enemy’s economy and blocked the import of French goods. Not long after, genever overtook brandy as the most fashionable drink of the time. A distilling act passed a year later to encourage the distilling of spirits and ensured the dominance of domestic spirits for centuries. But what about the years before William III sailed his fleet to England? Genever must’ve been invented at some point in history. Who is responsible for the luminous idea of distilling juniper berries? Who is deserving of lavish praise? Not Dr. Sylvius, that’s for sure. Sylvius proved himself a gifted and talented physician, physiologist, anatomist and chemist. In 1658 he was hired as professor of medicine at the University of Leiden for an astonishing annual salary of 1,800 guilders, twice the going rate at the time. During his tenure, he researched distilling medicines with botanicals. However, that’s as close as he ever got to producing genever or gin. Nevertheless, he is often credited with being the founder of genever and, by association, gin. According to legend, Sylvius created genever almost by accident while he was researching a cure for stomach and kidney disorders. One of these cures was a medicine distilled with juniper berry oil. The story even goes that Bols later commercialised one of Sylvius’ recipes. That must’ve been some medicine. Reputable sources don’t do much to rebut the story. The Encyclopædia Britannica includes him in its entry on gin. Not surprisingly, many (highly-regarded) websites and blogs take the Sylvius myth and present it as fact. 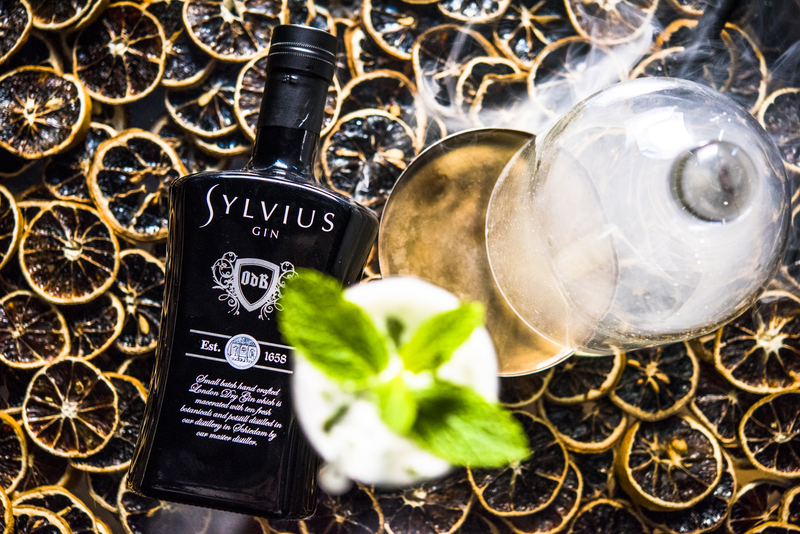 Almost 350 years after Sylvius’ death, there’s a brand called Sylvius Gin, which is admittedly delicious, made by Dutch distillery Onder de Boompjes. Indeed, the legend of Dr. Franciscus Sylvius is persistent. Such a shame that it’s false. It is hard to pinpoint exactly when or why Sylvius’ name was dragged into gin history. One theory is that he was named the inventor of genever simply because he was one of the most famous scientists of his day. Maybe it was the work of an overzealous marketer trying to up the reputation of genever. Luckily, it’s not hard to disprove his involvement in juniper-flavoured spirits. Firstly, none of his research papers contain any reference to genever. That is fishy, although maybe not conclusive. Importantly, the dates don’t add up. In England the existence of genever is proven in The Duke of Milan, a play by Philip Massinger from 1623. In it, the word “geneva” (an Anglicised name for genever) was used as a snide comment about alcohol consumption. Franciscus Sylvius, or little Franz de le Boë at the time, would only have been nine years old. But wait, there’s more. In 1606, years before Sylvius was even born, the Dutch levied taxes on genever and other spirits that were sold as alcoholic drinks instead of medicine, strongly suggesting that genever had stopped being used as a medicinal remedy, but was instead used recreationally. The remaining question is simple: If not Dr. Sylvius, then who? The answer is less straightforward. Could it be Philippus Hermanni who wrote Een constelijck Distilleerboec in the sixteenth century in Antwerp? In it he included a recipe for juniper infused brandy. Or might it be Jacob van Maerlant? This Flemish poet mentioned genever in Der naturen bloeme. It was first published over seven hundred years ago. It’s impossible to say, because neither can unequivocally be called genever’s inventor. What we know, is that it originated between the thirteenth and seventeenth century. Let’s just say the history of genever and gin is open to interpretation. Except for it being an invention of Dr. Sylvius. That is very much untrue.